The "shale revolution" of the 21st century has vastly increased the production of oil in the United States. 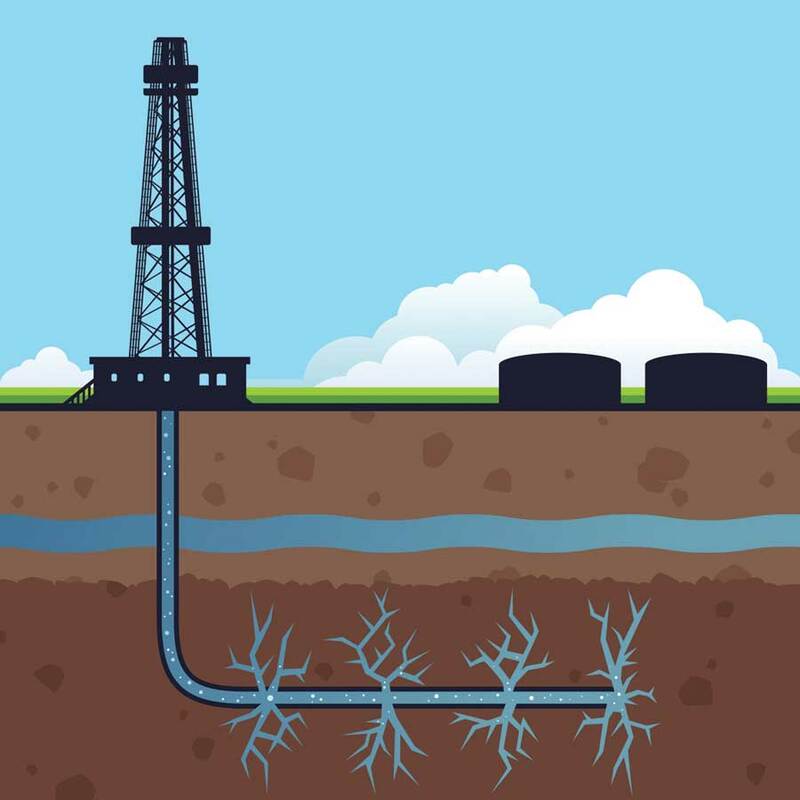 The boost that started this revolution is partially credited to new technology — a combination of horizontal drilling and "fracking," or hydraulic fracturing. These technological developments, combined with high oil prices, have increased the production of shale oil around the world, led by the U.S. state of North Dakota. Hydraulic fracturing or “fracking” occurs after a well has been drilled, and the casing (steel pipe) is inserted into the well. The casing is punctured within the “target zones” that contain shale oil. The fracking fluid is inserted into the well, and flows through the holes into the target zones. Eventually, the target formation cannot absorb the fluid as quickly as it is being injected; at this point, the pressure produces a crack or “fracture” in the formation. After the fractures have been made, injection stops, and the fracking fluids begin to flow back to the surface. The solid material (frac sand or ceramic proppants), is inserted as part of the fracking fluid, which stays in the target zones of the formation to hold open the cracks. Many engaged in the conversation argue that statistics alone are enough for hydraulic fracking to be considered unsafe and detrimental to the environment. But opponents claim that greater accessibility to a domestic oil source benefits the United States because it reduces the dependence on imported oil. Eric De Place of Sightline Institute explained that the transportation of this fossil fuel should be at the forefront of the discussion, particularly here in the Pacific Northwest because of the coastal terminals. After fracked oil reaches the coastal states, it can now be exported across the Pacific to Asian economies--feeding their energy demands (See Energy Exports). With oil prices rising beginning in the early 2000s, employment in the oil and natural gas sector began growing as well. The boom of oil production that took place after the financial downturn of 2008 played an important role in justifying the establishment of operations such as the shale oil industry. Although it seems the fossil fuel industry has boosted the U.S. economy, there is little evidence to showsignificant impact from oil-related occupations on US employment/labor statistics. Even with the rather small contribution to the U.S. economy, fossil fuel industries have seen a surge in government support--in the form of tax exemptions and generous land leasing terms. The shale oil formation that is connected to the Pacific Northwest is called the Bakken Formation (See Bakken Oil Shale Basin). . This region spreads over western North Dakota, eastern Montana, and southern Saskatchewan. Bakken oil extraction has caused considerable harm to communities and people living in the Bakken "oil patch," as well as those who live along rail transport lines. The resources used or exploited in these fossil fuel operations across the United States is overwhelming. In 2010, the U.S. Environmental Protection Agency (EPA) estimated that 70 to 140 billion gallons of water are used to fracture 35,000 wells in the United States each year. The use of water for fracking has made communities aware of the potential environmental impacts on freshwater aquifers. The use of water with hydraulic fracking does not only deplete freshwater supplies, it negatively impacts the aquatic habitat. Transportation of water also adds to the operation’s total carbon footprint. This could take form through air pollution or the resources used for safety and road repair issues (See Megaload Heavy Haul). We are producing and consuming at a rate never seen before. The consumers of the United States represent enormous political power. The fossil fuel industry is trying to get away with as much as the public allows, whether the public is informed or not. With the Keystone Pipeline being vetoed by President Obama in 2015, the discussion around shale oil and the fossil fuel industry is shifting. We are in a very pivotal time for decisions made around fossil fuels because resolutions made now will affect generations to come. As public awareness develops around shale oil, a shift in who bears the responsibility of these operations will become apparent. The American people must hold the fossil fuel industry responsible for the environmental and community devastation that has occurred. Looking forward into the 21st century, there has to be a drastic change in our perception of energy. Investing in clean, renewable energy like wind and solar is the direction the United States should be heading in today. De Place, E. (2015, November 11). Ethnography paper [Telephone interview]. Kusnetz, N. (2011, April 18). Fracking Chemicals Cited in Congressional Report Stay Underground. Pro Publica. Valdmanis, R. (2015, November 6). U.S. fracking boom added 725,000 jobs -study. Crosby ED.